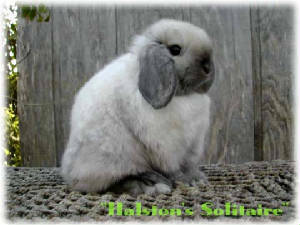 Halston's Rabbitry is owned and operated by Larry Lopez and his neice Nikki Plata in sunny San Antonio, Texas. After 20 plus years of running a small hobby kennel, showing and breeding Poms & Brussels Griffons, I decided to expand my interests into Rabbits. Holland Lops caught my eye and the rest is history. I hope to continue in the tradition of the Halston name by breeding the best animals possible with regard to their well being first and foremost. I would like to thank Reneah Raffay of Our One Rabbitry for parting with her beautiful stock and most importantly for her friendship and to Tracy Lukeman of THF Saynora for contributing to our breeding program with some wonderful breeding stock. Special thanks to great friend Joy Kretzer of The Holland Hut for helping this newcomer from the beginning. And last but certainly not least to Kristie Lee, who without her talent and help, touring my website would not be possible. So please take a tour and enjoy!